Artist Jackie Paton designed her lively new Halloween collection, On the Web, using her signature "stencilscapes" technique. She created freezer paper stencils and used Paintstiks® to develop the landscape and two smaller vignettes for her master panel. There are witches, houses awaiting trick or treaters, black bats and crows, pumpkins, a scaredy cat, mice, and candy corn stars, all beneath a crescent moon and ready for Halloween night. 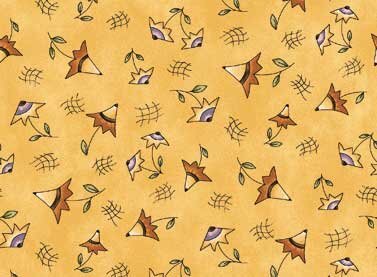 Companion prints include a coordinating border stripe, spider webs, candy corn stars, cat faces, small pumpkins, an allover of witches, pumpkins, and houses, a mini flower, and a wonderful autumn leaf and acorn print. The collection's name, On the Web, is a bit tongue in cheek because Jackie does not own a computer. In Jackie's world, crows perch on the web and mice run from web to web! 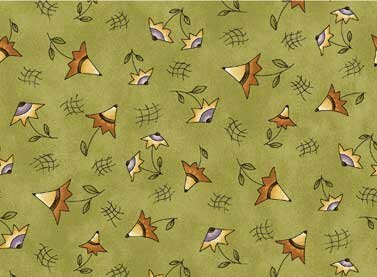 Jackie envisions her Halloween panel and coordinates in seasonal projects for the home: quilts, wall hangings, bed and table runners, placemats, aprons, valances and, of course, Trick or Treat bags. She has designed a quilt especially for her new collection. The pattern for this quilt will be free to download when the collection ships.